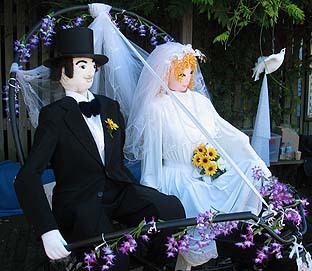 This scarecrow display idea shows the bride, Daisy Bell, and her groom on their Bicycle Built for Two, as in the old song. A wedding dove is in the background. 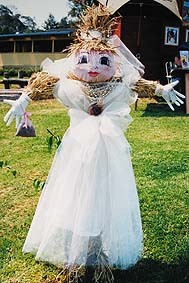 This bride scarecrow was a white bear in a bridal gown. The scarecrow groom was a black bear in a top hat. This cake, made from two cardboard boxes, was built for the Bicycle Built for Two scarecrow display. 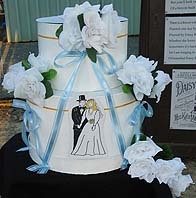 The wedding dove was concealed inside the cake until it 'flew' out in its special part of the wedding ceremony. 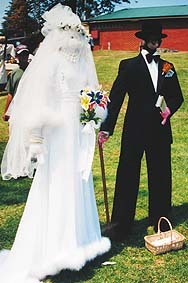 Note: This page includes bride and groom scarecrow ideas for you and your kids to make for a scarecrow wedding theme : bridal scarecrows in wedding dresses, scare crow grooms in formal dress and a scarecrow wedding cake.